Its innovative design enables the capture of multiple highresolution, uncompressed images (Visible, IR & UV). 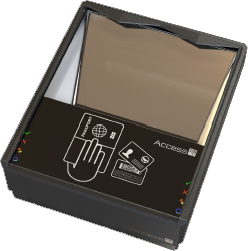 In comparison to existing scanners, the transaction time is significantly reduced delivering productivity and cost savings. ATOM’s design sets it apart from other readers and allows for both desktop use and simple, elegant into countertop and kiosk integration. Its innovative ‘shark fin’ document guides ensure that even the most widely travelled documents quickly slide onto the glass, easing down bent corners for a perfect read. Like its predecessors, ATOM still delivers lightning fast MRZ decoding, whilst simultaneously reading RFID data from eDocuments, including those meeting the latest ICAO LDS standards. 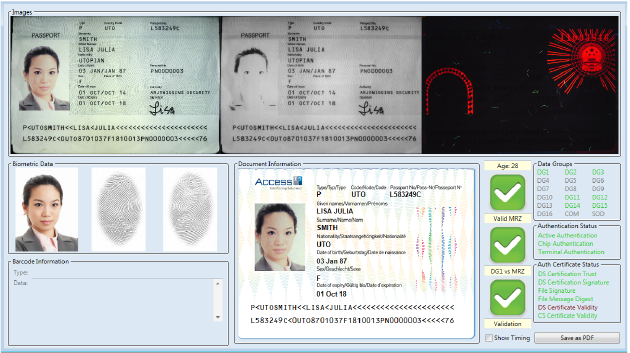 Additionally, high performance 1D/2D barcode reading ensures that the ATOM delivers a rich feature-set. 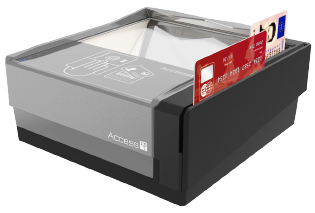 The ATOM can be supplied with its innovative Expansion Dock to provide either contact smart card reading, magnetic stripe reading or both. The elegant ‘drop-in’ design means that the unit can be supplied already mated, or retrofitted in the field in just a few seconds.